a few days ago, ryan was home with leko while i was working. i laughed out loud when ryan texted me this picture of leko "hunting" a squirrel through the window. the squirrel was sitting on top of our porch railing and apparently that bothered leko to no end. sometimes i'm convinced that the creatures outside (squirrels, chipmunks, birds, etc.) purposely taunt leko through the windows! Ahh, so close and yet so inaccessible!!! It can be frustrating to be a cat. I bet he loves his new foot stool so he can run further from side to side to see the squirrels from all angles. 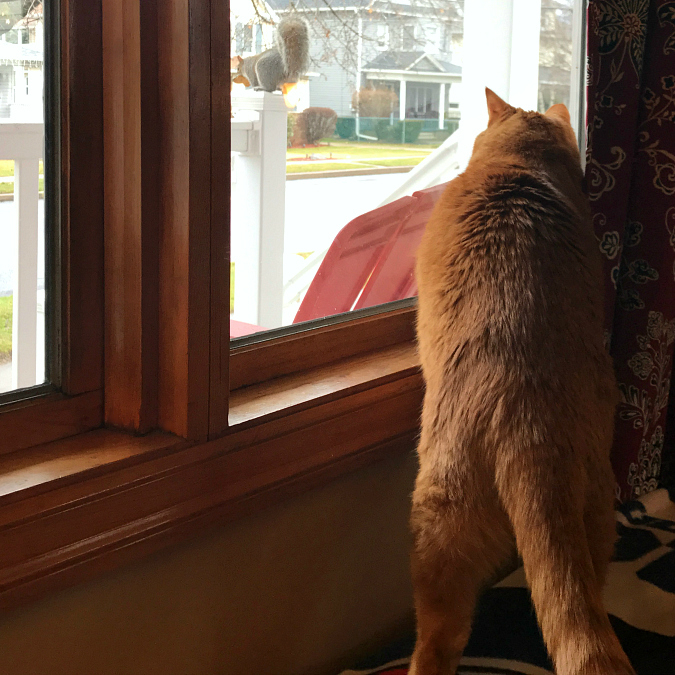 What would he do if the squirrel came up to the window?